Mussolini predicted that the communism would eventually evolve into fascism. 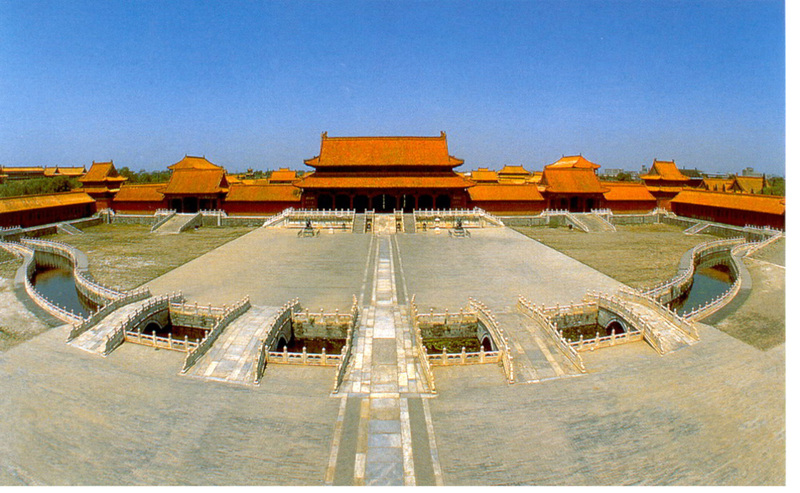 Today, his prophecy has been fulfilled in the form of modern China. that he was able to hide the location of his huge tomb for over 2000 years. 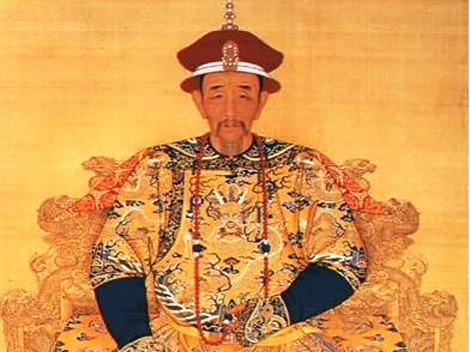 China's imperial system has long been a totalitarian fusion of Legalism and Confucianism. It is also important to note that had Chiang Kai-shek won the Chinese Civil War instead of the communists, China would have immediately become a fascist state. The connection to Chiang Kai-shek to fascism is one of the untold stories of the 20th century, and like many untold stories in 20th­century history, the fact that it is untold is not an accident, it is the political manipulation of history for political purposes. A critical force in modern Chinese history was the German military mission to China. The reform, reorganization and rearmament of the Chinese army was heavily dependent on the German military mission to China. Chiang Kai-shek was Germany's number one ally from the time of the German military mission to 1938 when Hitler ended the mission as a result of the alliance that Germany had with Japan. This military mission helped enable Chiang to defeat Mao and forced the Chinese Communists into the long march. The head of the German military mission was none other than General Von Seeckt, the mastermind of Germany's secret rearmament after World War I. Now this was not just a military situation. Chiang tremendously admired fascism and looked to create a fascist state in China. Also very important, when Chiang had the opportunity to create his own state in Taiwan he most definitely did not create a parliamentary democracy, he created a variation of a fascist state in Taiwan. So why is this not that well known? It's not that well known because the Chinese German alliance came apart due to the fact that Ribbentrop (who became Hitler's Foreign Minister) was very infatuated with Japan and in 1936 Germany and Japan signed an alliance. 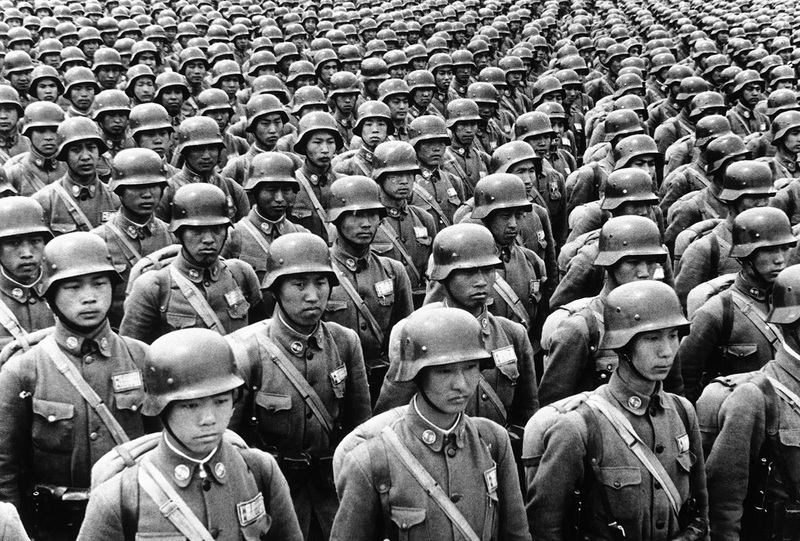 In 1937, due to the blundering ineptitude of the Japanese government, Japan blundered into a war with China. So Germany was in the situation where they were in an alliance with one country, and they had a military mission with another country - China. German military advisers were sometimes shooting Japanese troops. Now it was a huge blunder on the part of Ribbentrop and Hitler to have abruptly ended the mission altogether, and they also cut off arms sales at the same time which eliminated any German leverage in ending the war in China. The decision of the Japanese to blunder into a war with China would have catastrophic results in the long run for the Axis powers. The confusion about China's political direction, particularly Chiang's, follows the decision in 1938 of the Germans to end their connection with China, because that left China very dependent on America. So a huge propaganda campaign was launched to show that Chiang Kai-shek was in favor of freedom. US business as usual was deeply involved in this, and just as they tried to whitewash the current Chinese fascist government, they then tried to whitewash Chiang Kai-shek as a great lover of democracy etc. etc. This propaganda was distributed all over America. The US evangelical Christian movement was also hard at work on this because they were going to "save China for Christ", and Chiang Kai-shek professed to be a Christian. So they launched a huge propaganda campaign that Chang Kai­shek was the George Washington of China. Things reached a probably utterly nonsensical state with the US government's "Why We Fight" film for China, which made the utterly ludicrous claim that China had never attacked anybody, it was a peace-loving nation throughout its history, and that that Confucius had the same ideas as Jesus Christ. So it was supposedly logical that people would go from Confucius to Jesus, and that we would win China for Christ and so on and so forth. So fascism is very much alive in China and we see China evolving probably into more of a fascist direction. There are differences between China and Nazi Germany and Italy in so far as that the Chinese government is sort of a bureaucratic dictatorship, and it's not clear what the total popular support is, since there is such total and complete repression. But we do see the Chinese government now and probably more so in the future whipping up anti­western nationalism (particularly against the United States) as a means to further justify its grip on power. The future of China remains authoritarian, and China will become even more of a fascist state as time goes on. One of the most interesting things is the secret Chinese eugenics program doing biological research about breeding people. So this is definitely a fascist structure, and as time goes on we see this evolving to become more and more like a fascist state. The fairy tales of people like Clinton, that the more we traded with China the more they'd become a democracy were just that - fairytales. But political fairytales usually have a very malevolent intent, and these most definitely did too, because Clinton and the moneyed elite in the United States (not all moneyed elite, but a good part of the moneyed elite) were and are quite willing to deceive the American people about China. It's interesting that Clinton claimed (as the leader of America) that China was America's strategic partner. If you read a lot of the hot air of the American leadership elite, they're always talking about the strategic relationship with China and the fact that China is the linchpin of the New World order. Well think about that. The linchpin of so-called "democracy" (America's New World order) is the number one fascist state in the world today. Just think that through about what that says about the world future. So fascism is very much alive in China and getting stronger. And as China becomes stronger, the whole structure of an authoritarian Asia comes more and more into view. Mao was the greatest mass murderer of all time, killing over 60 million people. Today, China sees him as a hero. 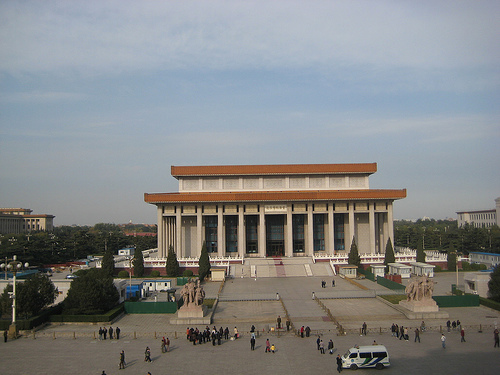 His giant mausoleum dominates Tiananmen Square. See our report Mao and Terror .